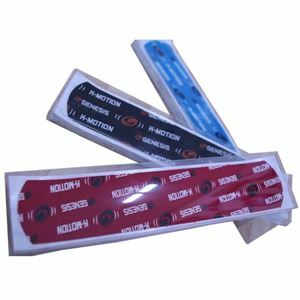 K-Motion Tape with Copper Infuzion is an innovative Kinesiology tape solution for treating and preventing common repetitive bowling injuries such as wrist, forearm, elbow, shoulder, knee pain and more. K-Motion is the first tape of its kind with copper infused into a highly elastic synthetic / cotton hybrid material, and has proven highly effective for bowling’s repetitive motion. Applied correctly, it provides pain relief, increased support and stability for injured or weakened muscles, delays fatigue and can ease joint soreness without sacrificing freedom of movement or comfort. K-Motion with Copper Infuzion is very easy to apply, is anti-microbial, and can be worn for 3-5 days at a time, providing days of relief. Includes 20 Pre-Cut Strips - 2" x 10" each.